"State of the Art - a superb review of contemporary scientific knowledge of cannabis therapy. Contains new and updated information based on international sources, much of which was previously unavailable in English." 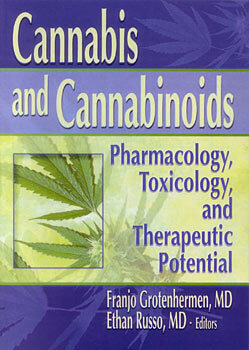 "A comprehensive review of the pharmacology, toxicology, and therapeutic potential of cannabis. Both natural and synthetic cannabinoid compounds are reviewed by a distinguished list of authors, all of whom are active researchers in the field." "An invaluable resource. From botany to biology, from pharmacology to policy, from physiologic actions to adverse experiences, this volume covers the territory with erudite and richly referenced chapters from the major experts in the field today. I will use the text over and over again as a reference and strongly recommend it to all members of my research team. This is the state of the art volume in this emerging field." -- Donald Abrams, Marijuana Researchers, Center for Medicinal Cannabis Research, UCSF. "Clear and understandable...detailed and comprehensive. The editors have assembled an unprecedented international 'who's who' of cannabis and cannabinoid researchers....a tour de force covering every aspect of this much misunderstood plant." -- David Hadorn, Physician, Victoria, B.C. "At last--a book that presents an objective as well as clear and rather comprehensive description of the state of the art of medicinal cannabis....A great achievement considering the fact that many social implications, as well as opposing political credos, have often masked the truth in this important issue."